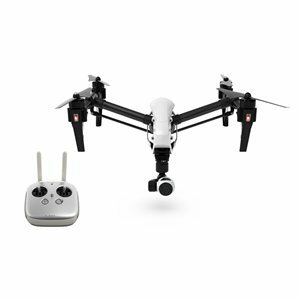 The DJI Inspire 1 is the latest creation from DJI Innovations featuring a 4k fully stabilised 360 degree freedom of movement camera with new transforming design. Comes with a Lightbridge Built in for HD Wireless downlink and a 6S Intelligent flight battery. With the touch of a button, the DJI Inspire 1 takes off and will transform itself into a “V” position, allowing pilots to capture images from any angle. Similarly, the revamped “dynamic home point” function enables pilots to ensure their unit always knows where they are and can return to them safely. During flight, the platform stabilizes itself using a downward facing “Optical Flow” camera that uses a stereoscopic image of the ground to ensure it does not drift, even when flying indoors or without GPS. The DJI Inspire 1 also comes with a brand new 6-cell battery, enabling it to spend up to 18 minutes in the air. Pilots will be able to monitor each cell’s strength through the app to ensure safe flight, in addition to DJI’s signature automatic landing function in the case of low battery.
? Improved motors, propeller design, flight controller and electronic speed controllers (ESC) to provide more finely tuned flight controls. DJI – Introducing the Inspire 1 from DJI on Vimeo.